From the back cover: "Although not about to say "I do" anytime soon, hip party-planner Madeline Bean is no stranger to the phenomenon known as the LA wedding; the good, the bad and the kind where the party lasts longer than the marriage. Still, Maddie never expected to be the guest of Vivian Duncan, the West Coast's grande dame of wedding consultants, at a lavish affair held amidst the dramatically lit fossils in the Nature Museum's Hall of Dinosaurs. While checking out the glittering event, Maddie, with her keen event planner's instinct, realizes something is not quite right, but what? The groom is on time. The bride is beautiful. And a corpse wearing a Cartier bracelet is dangling from the triceratops skeleton. Ah, yes. That. With people disappearing and the bride in tears, Maddie just may be the next species to become extinct...unless she can reveal the murderer fast. Quicker than she can whip up a white chocolate wedding cake, Maddie follows the trail deep into dark jungles - urban and otherwise - amid tantalizing tales of smuggled gems, while fending off a nervous bridegroom, a crazed carjacker, and a half-naked ice sculptor and his trusty chainsaw. Along the way, she discovers something old, something new, something deadly and something a wedding pro should never, ever do." Enjoyed this one and it kept my interest right to the end. I liked the sleuth too. Will read more by this author. This is going into Loriped's Holiday Mystery Bookbox. Enjoy! This came home in my Holiday Mystery Bookbox. I have only read one other Madeline Bean mystery and I really enjoyed it, so I'm looking forward to reading this one. Thanks for sending it my way. I really enjoyed reading this book. I just love the main character and hope others will also. Adding to herbwench's perpetual cozy box. Chosen out of Herbwench's Cozy Mystery Box. 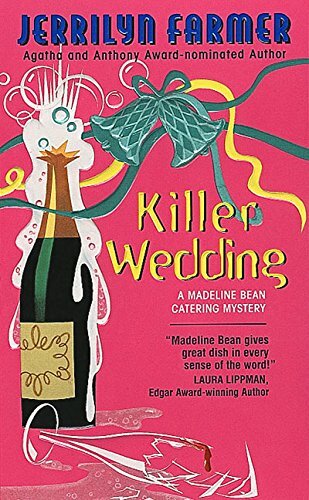 I have read another Madeline Bean Catering Mystery (although I cannot remember the title) and am sure I will enjoy this one too.